How do you play bigger when you’re a one (wo)man show? How do you confidently say yes to an opportunity without drowning in the added work? That was the dilemma my friend Michelle Fifis found herself in late last year. Owner of the Pattern Observer website and the Textile Design Lab for textile designers, Michelle was offered a partnership opportunity with a trade show in her industry. They were looking for someone to write their newsletter, improve the connection with their current audience and reach out to new designers in the industry. She really wanted to accept the opportunity, and was excited to work with the trade show, but every idea she came up with to help them meant more work for her — work that she didn’t have time to take on. “I’ve known Lacy I think for years now and always heard about the work she was doing with clients and was just waiting for an excuse to work with her, honestly. I had the idea that Lacy could come in and really help me with a lot of the work that I would now be doing for the trade show. “It could have become one of those projects that was very draining on me and took all my time, but her team is so amazing that it’s just been really effortless. When Michelle approached me with the idea, I was all on board, but I knew we would need a clear strategy in order to make sure that our writers could execute her vision seamlessly. It happened that I was hosting my first Work & Learn Group Strategy Session and I invited her to join. “I participated in the all-day VIP Work & Learn sessions where we came together as a group. During that day I went through Lacy’s exercises for thinking about your customer, thinking about the journey that you want to take them through over the next, I think it was six to 12 months. I planned out kind of the overarching calendar for the content. That was a really nice way for me to develop what I wanted the calendar to look like and then take that to her team to actually develop a lot of the content. Once Michelle had her plan, it was as simple as introducing her to her new writer, Marie. “I liked how effortlessly Lacy on-boarded me and then assigned my project to one of her writers. As a business owner I feel like that went so well that I was like, ‘Oh, awesome job Lacy.’ You know scaling a business can be so hard. I’ve had that issue in my own design business where clients get very clingy and they don’t want to be passed off to someone else, even if the other person is even better than you are. “I think at first I was a little nervous about if the writer she assigned me, Marie, was going to be able to get my voice. Then I immediately was like, ‘What do I do if I don’t like Marie?’ You know because I’m friends with Lacy. She said, ‘You know if something doesn’t work out, let me know.’ I was just a little hesitant about how that was going to work since I wasn’t working with Lacy. “But now I just feel great because Marie’s such a good fit. I don’t know how she partnered us up but it worked out really well. “I think the biggest thing is that when I drop the ball, Marie picks it up. That means a lot to me. I feel like I can really rely on her. It’s so nice not to always be worrying about it. I had the flu last week and my kids were all sick and Marie just kind of took it upon herself to make sure I made the deadlines and she was already brainstorming for the next month. In addition, because we’re working from the plan Michelle developed during the Work & Learn Group Strategy Session, Marie can move forward without a ton of input, so deadlines get met even when life happens. We were able to take that piece off Michelle’s plate so she didn’t have to worry about finding the time/energy to fulfill her commitment or about losing the deal with her trade show partner. Win/win! 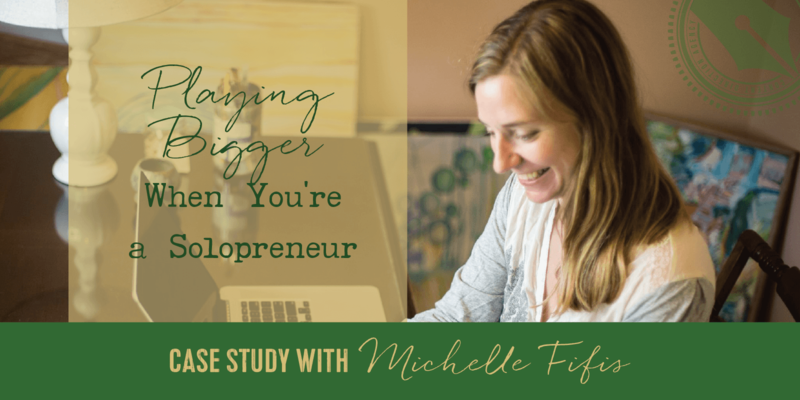 Interested in talking about how we could help you play bigger as a solopreneur? Click here to learn more about our services and fill out our short application today!